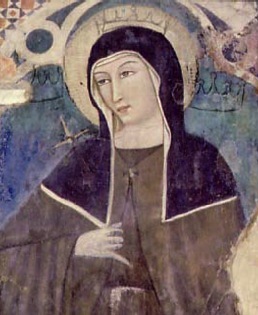 Younger sister of St. Clare and Abbess of the Poor Ladies, born at Assisi, 1197, or 1198; died 1253. 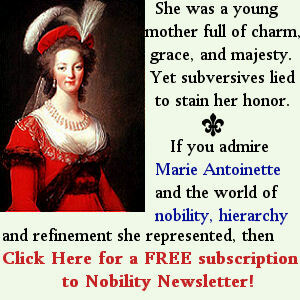 She was the younger daughter of Count Favorino Scifi. Her saintly mother, Blessed Hortulana, belonged to the noble family of the Fiumi, and her cousin Rufino was one of the celebrated “Three Companions” of St. Francis. Agnes’s childhood was passed between her father’s palace in the city and his castle of Sasso Rosso on Mount Subasio. On 18 March, 1212, her eldest sister Clare, moved by the preaching and example of St. Francis, had left her father’s home to follow the way of life taught by the Saint. Sixteen days later Agnes repaired to the monastery of St. Angelo in Panso, where the Benedictine nuns had afforded Clare temporary shelter, and resolved to share her sister’s life of poverty and penance. At this step the fury of Count Favorino knew no bounds. He sent his brother Monaldo, with several relatives and some armed followers, to St. Angelo to force Agnes, if persuasion failed, to return home. The conflict which followed is related in detail in the “Chronicles of the Twenty-four Generals.” Monaldo, beside himself with rage, drew his sword to strike the young girl, but his arm dropped, withered and useless, by his side; others dragged Agnes out of the monastery by the hair, striking her, and even kicking her repeatedly. Presently St. Clare came to the rescue, and of a sudden Agnes’s body became so heavy that the soldiers having tried in vain to carry her off, dropped her, half dead, in a field near the monastery. Overcome by a spiritual power against which physical force availed not, Agnes’s relatives were obliged to withdraw and to allow her to remain with St. Clare. St. Francis, who was overjoyed at Agnes’s heroic resistance to the entreaties and threats of her pursuers, presently cut off her hair and gave her the habit of Poverty. Soon after, he established the two sisters at St. Damian’s, in a small rude dwelling adjoining the humble sanctuary which he had helped to rebuild with his own hands. 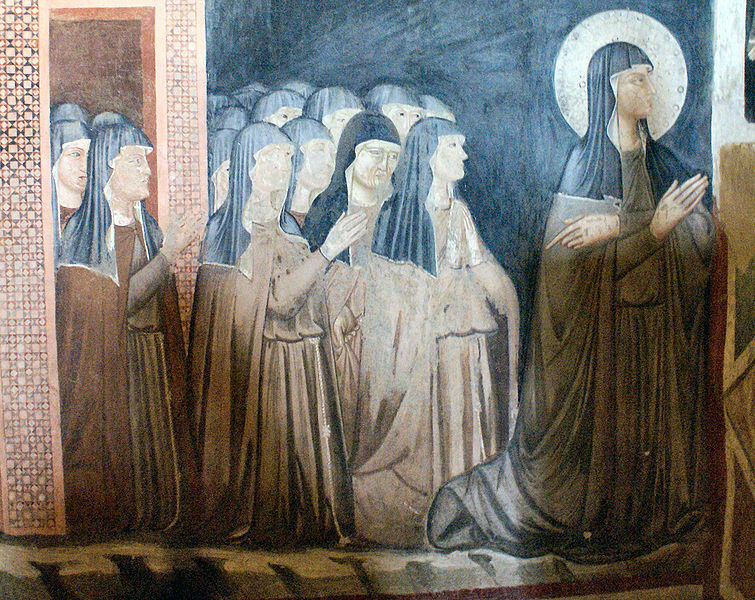 There several other noble ladies of Assisi joined Clare and Agnes, and thus began the Order of the Poor Ladies of St. Damian’s, or Poor Clares, as these Franciscan nuns afterwards came to be called. From the outset of her religious life, Agnes was distinguished for such an eminent degree of virtue that her companions declared she seemed to have discovered a new road to perfection known only to herself. As abbess, she ruled with loving kindness and knew how to make the practice of virtue bright and attractive to her subjects. In 1219, Agnes, despite her youth, was chosen by St. Francis to found and govern a community of the Poor Ladies at Monticelli, near Florence, which in course of time became almost as famous as St. Damian’s. A letter written by St. Agnes to Clare after this separation is still extant, touchingly beautiful in its simplicity and affection. Nothing perhaps in Agnes’s character is more striking and attractive than her loving fidelity to Clare’s ideals and her undying loyalty in upholding the latter in her lifelong and arduous struggle for Seraphic Poverty. 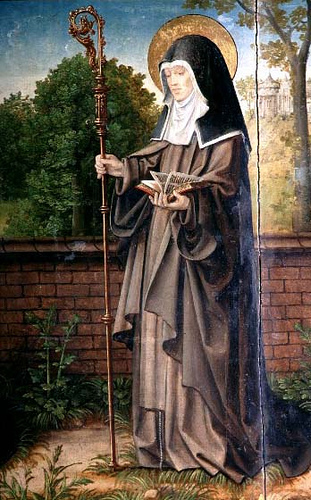 Full of zeal for the spread of the Order, Agnes established from Monticelli several monasteries of the Poor Ladies in the north of Italy, including those of Mantua, Venice, and Padua, all of which observed the same fidelity to the teaching of St. Francis and St. Clare. In 1253 Agnes was summoned to St. Damian’s during the last illness of St. Clare, and assisted at the latter’s triumphant death and funeral. On 16 November of the same year she followed St. Clare to her eternal reward. Her mother Hortulana and her younger sister Beatrice, both of whom had followed Clare and Agnes into the Order, had already passed away. The precious remains of St. Agnes repose near the body of her mother and sisters, in the church of St. Clare at Assisi. God, Who had favoured Agnes with many heavenly manifestations during life, glorified her tomb after death by numerous miracles. Benedict XIV permitted the Order of St. Francis to celebrate her feast. It is kept on 16 November, as a double of the second class.